OfficeCalendar is an easy-to-use, low-cost, alternative to Microsoft Exchange Server. 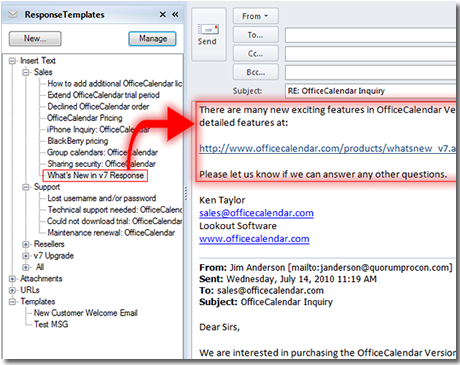 OfficeCalendar enables the sharing of Microsoft Outlook calendar, email, contact and task folders and does not require Exchange Server or dedicated hardware. Office Timesheets is a web-based timesheet software application adapted to the specialized needs of project-driven organizations that require employee time tracking and time reporting for accurate job costing/accounting and/or billing of professional services. Response Templates for Outlook 2003, 2007, 2010, 2013, 2016 and 365 is an email management tool that automates the email response process and allows companies to gain more control over the content of their email messages. Pricing starts at just $59.95. Because you use pre-written templates (text, attachments and/or URLs) in order to respond to frequently asked questions, you can ensure that your answers are always the best and most concise responses possible. The Response Templates addin for Microsoft Outlook greatly increases the number of email messages an employee can respond to by cutting out the time spent re-typing the same or similar replies over and over. Although you use pre-written texts with Response Templates for Microsoft Outlook, after inserting the text from the template into the email you can add information or adjust the text, making the response personalized to the specified email inquiry which avoids the issue of having your emails look like automated replies.